We have been deeply saddened by the terrible loss of life and devastating destruction caused by Cyclone Idai in March 2019. We are keeping a close eye on the situation on the ground as the affected areas recover, so please do ask us if you have any travel concerns. Expert Africa has made a donation of £1000 to Care International, who are working to relieve the situation in Mozambique. We will also be giving an extra £100 for every new booking we take before the end of May for a trip to Malawi, Mozambique or Zimbabwe. We recognise that supporting the economies of each country at this critical time is as important as immediate disaster relief funding: all the areas we normally send visitors to in Zimbabwe, and many in Malawi and Mozambique, are unaffected by the cyclone – but they cannot afford to lose the vital income that tourism generates for them. Malawi is a small country at the southern end of Africa's Great Rift Valley, and holidays to Malawi are very relaxed affairs. Malawi is a densely populated nation, with green productive land, lots of small traditional farms and famously friendly people. Malawi has few safari areas, and none are very famous. 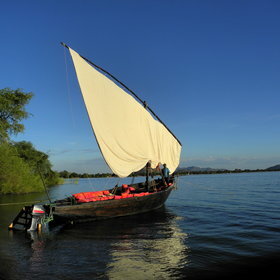 There is relatively little tourism in Malawi. Watching local children play around the lake, you'll quickly understand why Malawi is promoted as the 'Warm Heart of Africa'. The physical and spiritual backbone of the country is Lake Malawi, stretching for over 300 miles and covering more than 20% of the country in water. These clear, mineral-rich waters teem with countless, brightly coloured cichlid fish, most of which are endemic. Away from the lake, three high plateaux, Nyika, Zomba and Mulanje, tower above rolling farmlands; ideal for gentle hiking holidays amidst moorlands and forests – and some opportunities for some unique wildlife safaris. Meanwhile, remember that Malawi is particularly easy to combine with Zambia's South Luangwa National Park; relaxing beside Lake Malawi makes a great end to a safari. Flying from the Luangwa's Mfuwe Airport to Lilongwe takes around an hour, call us for more ideas of how best to combine a beach holiday in Malawi with a safari to Zambia.